In this article, I am going to share Visual Studio keyboard shortcuts and some very useful productivity tips. 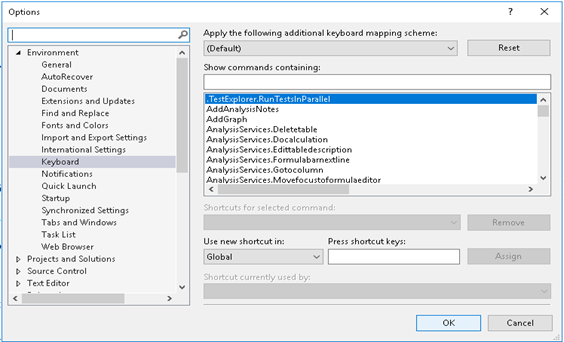 Using the keyboard instead of the mouse really helps a lot to improve coding speed and Visual Studio has provided many great features with keyboard shortcuts, along with providing functions to add our own shortcuts by just following a few steps. Below are the keyboard shortcuts which I have divided into two sections - Windows Management and Editor Management. The "//" sign is used to add comments. Add constructor Type ctro + tab tab same for other prop, if, for, intr, foreach, try etc. //very usefull to add new proerty, method, constructor, class, if else, try catch. just type 2-3 charactors and it will generate whoe syntax. If any shortcut does not work then a new shortcut can be defined in Visual Studio. Follow the below steps to define shortcuts. Go to Tool > option: The following window will appear. Select keyboard in the left panel then type desired function in the "show command containing" box then select the command then move cursor to “Press shortcut keys” box and press the key for a new shortcut. If that shortcut is already defined for any other function it will display below, then click ok.